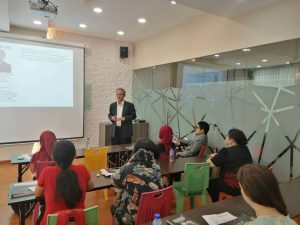 We jumpstarted 2019 with our first tea talk of the year by Mr. Allan Lee, Director of Consulting Services at Friday Concepts (International) as well as Head of the BCM Faculty at IERP, who spoke on the value of business continuity management (BCM) through the lens of Value on Investment (VOI). VOI helps measure the total value of ‘soft ‘or intangible benefits derived from continuity initiatives in addition to those “hard” benefits measured by ROI. Its approach is critical to allow funding for continuity planning efforts that provide the competitive differentiation necessary in today’s dynamic business landscape. Business continuity is defined as getting your business up and running at the quickest time possible, with minimal losses to your business. Mr. Allan highlighted current perceptions concerning BCM. According to The Resilience Gap Report 2017, even though 96% of those surveyed believed that business resilience SHOULD BE a core element of their company’s overall business strategy, only 54% claim that business resilience is a focus. This statistic proves that although BCM is recognized among businesses it is not comprehensively integrated and practiced by organisations as intended because BCM does not support a strong ROI. In Malaysia, there is a need to raise awareness on BCM among organisations. It is an ongoing effort to make our companies more competitive. Leaders play an essential role in ensuring BCMs are comprehensive and tailored towards their organisation’s unique requirements as every organisation has different unique strengths, weaknesses, opportunities, threats and critical infrastructures. Adopting BCM by using a template found on the internet may defeat its purpose. Mr. Allan shared how there is no perfect BCM plan. Threats and landscapes regularly change – from personnel, technology, regulations and others. Therefore BCM is a continually evolving process for an organisation. Mr. Allan also provided insights in determining when a BCM plan is “fit for purpose” for an organisation. He explained that it depended on an organization’s risk appetite and criticality of its operations. Misconceptions on business continuity need to be addressed in our effort to improve BCM integration in organisations. Misconceptions that insurance alone is sufficient mitigation to cover losses can prove disastrous. Whilst Insurance may provide some financial protection, it does not contribute to protecting employees’ lives, resuming operations or managing brand value and reputation. Increased resilience against disasters and incidents. Competitive advantage – proper certification would present more business opportunities. More thoughtful business process – as BCM helps to create a more comprehensive business process. Mr. Allan concluded the talk after an interesting sharing session between participants. In a nutshell, with the current risk landscape, BCM is an essential tool to safeguard an organisation. He also has encouraged organisations to use standards like ISO 22301 – ‘Business Continuity Management’ which can assist the organisation to design and implement effective and efficient BCM.